Part 2 of a trilogy of works that responds to political conditions in the US since 2016. See Parts 1 and 3. In early 2018 Silton acquired a collection of old newspapers from the 1930s and early 1940s. In stark fashion all share an article about Hitler’s Germany. The artist is particularly struck by how the archive reflects an unfolding of events in a “daily” context—a harbinger of the imminent Holocaust. Returning to that era’s quotidian from the vantage point of our own is especially potent and unsettling. For this project, ten to twenty original newspaper pages are framed; placed between each is a black and white photographic image culled from Silton’s own previously unprinted proofsheets from the 1980s and early 1990s—observational in nature, documenting moments from everyday life—a dead possum, the shadow of a swing on sand, a group of people gazing upward at a subject off-frame, a church marquee with the words “DISTANT FROM GOD.” While in Quartet for the End of Time she holds a space for viewers to musically feel the work’s original historical context, in A potentiality… the artist inserts her own body and histories to insist on the importance of remembering the mundane across multiple generations, as well as on the vital role of a free press in disseminating truth. Silton conceived this project following her presentation of Quartet for the End of Time in 2017, and considers this, and The stain of________. A stain on________. to comprise a trilogy that reflects on the ways we absorb and document history and bear witness to trauma. 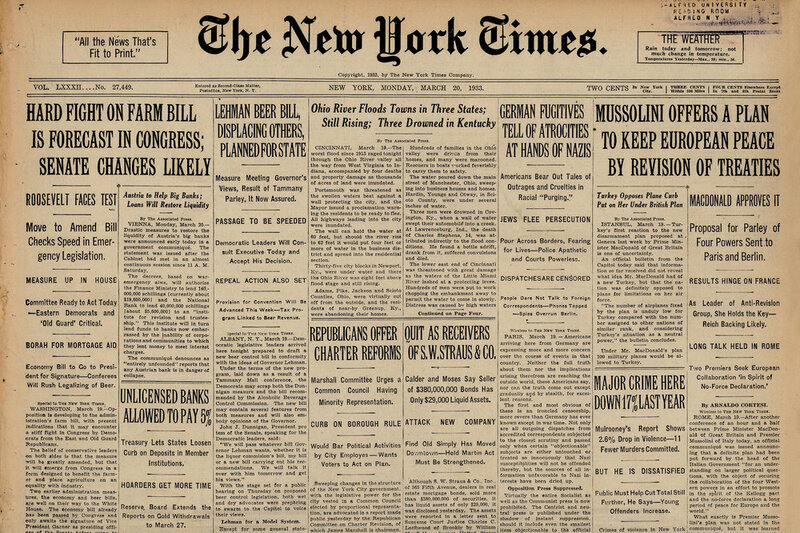 A potentiality… exists in various forms: the exhibited form as described above, and a mailed version, which consists of digital reprints of five New York Times front pages from the early 1930s. In January, 2019, Silton will be mailing the set of prints, one at a time over several weeks, to a list that includes political journalists and leaders at the forefront of civil rights advocacy in the US.